A good old fashioned vegetable that has been used in jams, stewed fruit and preverves for years, rhubarb is grown from crowns. It is the red stalks that are used, although not all Rhubarb is red, some varieties are yellow, others green. This is a long lived plant, once established it will produce for many years, relaibly providing those wonderful red stalks in abundance. It needs a cool winter to thrive and when grown as a perennial is best in USDA zones 3 - 8. In colder zones it can be treated as an annual, it does not cope well with the heavy freezes. Rhubarb is also not suited to hot humid climates, so the 'middle' zones are by far the best for growing it. With wonderful red stalks and big leaves, rhubarb can be grown in the perennial border or the vegetable garden. A number of varieties are sold, most of them excellent to home gardens. As with all plants, soil preparation is the key to growing Rhubarb. You also need to select the right position in the vegetable garden for best results. Rhubarb like full sun, a rich fertile soil with moisture but also free draining. Being a heavy feeder the key to growing rhubarb is soil preparation. Collect some well rotted compost before starting out. Rhubarb is sold as 'Crowns' and these are best planted in early spring. You do need to wait until the weather and therefore the soil begins to warm a little. Weed the area well, like most plants rhubarb does not like competition. Dig in lots of well rotted compost and some aged cow or sheep manure before planting. Crowns are available fro sale in winter, plant them out in spring as soon as the weather warms a little. 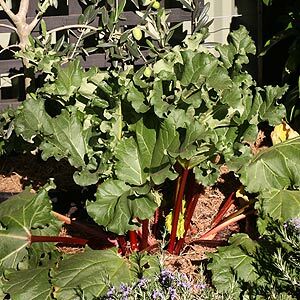 Space plants at 3 - 4 ft. Rhubarb is a large plant and needs space not only to spread but also for good air flow which helps prevent disease. Water the crowns in well with a liquid seaweed fertilizer and mulch lightly. Being a perennial Rhubarb demands a permanent position in the vegetable garden, some gardeners will plant it in the garden border as a healthy Rhubardplants looks great. Whereever you plant it give it a little space, it needs around 2ft between plants. This gives it room to grow, as well a providing good air circulation. Mulch around plants every spring and again in early summer, adding some organic compost and manure at the same time. Remove dead or wilted stems. As plants die back in colder zones, remove the stalks and mulch over with straw to protect from frosts and freezes over winter. The new shoots will push up in spring. Stalks are picked when thick and long, leave thin stalks. When harvesting leave 2 - 3 stalks to allow the plant to thrive. Best grown from crown division, you can and should dig and divide plants every 3 years. This is best done in early spring. STARK Bro's NURSERIES& ORCHARDS Co.